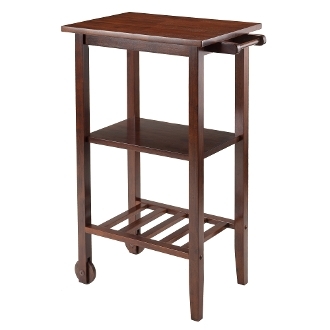 This Stevenson Kitchen Cart is perfect for small spaces in the kitchen or dining room. This cart will bring beauty to your kitchen while you work or simply use it for microwave stand or as a storage cart. The cart features one shelf and bottom slated shelf is for wine rack or use as a regular shelf. With one handle, it is easy to move your cart with two wooden wheels. Overall cart size is 24.60"W x 15.83"D x 36"H. Cart top surface is 21.65"W x 15.75"D. Middle solid shelf is 18.6"W x 14"D. Bottom Slated Shelf can hold up to 4 bottles of wine or use it as a shelf with area of 15.5"W x 14"D. Cart Top height is 36" from ground. Made from solid wood in warm walnut finish. Assembly Required. Overall cart size is 24.60"W x 15.83"D x 36"H. Cart top surface is 21.65"W x 15.75"D.
Solid shelf is 18.6"W x 14"D; Slated Shelf holds up to 4 bottles or use as a shelf 15.5"W x 14"D.
Cart Top height is 36" from ground. Made from solid wood in warm walnut finish. Assembly Required.